We offer the most professional, reliable, best-value and customer-focused service available. Our attention to detail, creatively and technically is second to none. In return you can expect a high-quality bespoke service. We work with you to ensure everything is delivered on time, to plan and within budget. Beautiful, colourful displays play a crucial role in encouraging tourism and visitors. They are of great value in helping to raise revenue and benefit the local community and your business. 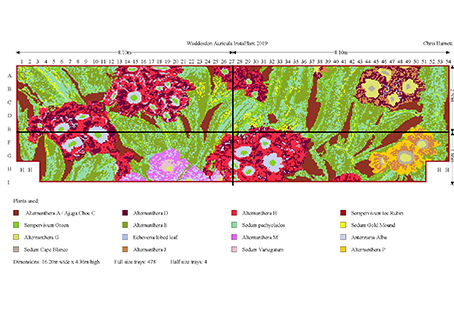 Once a design idea has been agreed, we use our bespoke computer program to bring your display to life, allocating an exact position for each plug plant. The design proof is then approved by the customer before production begins, so any changes can easily be made. Displays are then grown and produced identical to the design at our nursery by our skilled staff and delivered to site ready for you to install. 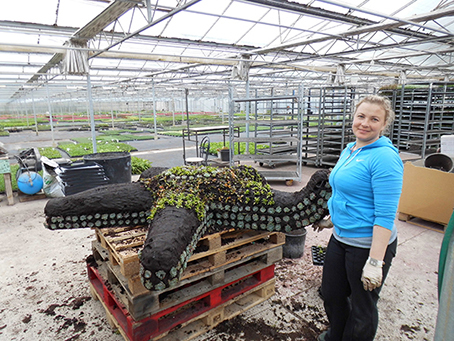 On delivery the pre-rooted tiles of plants simply slide out of their trays onto the prepared bed, transforming it into a colourful work of art in a remarkably short amount of time. 3D display installation could not be more simple! The framework arrives fully planted up and ready to be placed in situ. Do not forget! – We can also provide individual plants to help maintain your display and keep it looking at its best all year round. Our mission has always been to provide high quality displays for all to enjoy. From our customer service, to the quality of the final product, we are fully devoted to making sure you are 110% satisfied. For over 20 years we have been creating countless designs of all shapes and sizes, for all manor of customers. just take a look at our gallery to see a small selection of our designs!